We’re excited to share word about a new ongoing event organized by the owners of The Appalachian Artisan Society (TAAS) Gallery and Catawba Vale Cafe in Old Fort. Each Friday evening between 7pm and 9pm, guitarist Richard Valentine Tuttell hosts an MC Open Mic Night at Catawba Vale Cafe. There is no cover or admission cost. Additionally, TAAS Gallery now features Pisgah Yarn as an item for sale in the Gallery, plus Pisgah Yarn is offering classes at the Gallery, too. Each Saturday, Mr. Tuttell serenades customers, as well as students of Pisgah Yarns’ free Knit Picking Saturdays classes that take place from noon to 3pm. 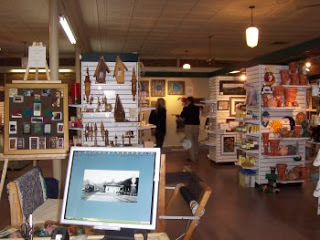 The TAAS Gallery offers items handcrafted by over 70 local artisans. If you don’t have a chance to visit the gallery in person, you can view items, learn about the artisans and shop online at www.taasg.com/. The Catawba Vale Cafe is next door to the Gallery in a beautiful building (the ceilings are our favorite feature). The Cafe offers a selection of deli-style sandwiches, paninis, wraps, soups, salads and hot and cold beverages. The Catawba Vale Cafe also features artwork by TAAS artists. If you do have a chance to see the Gallery and Cafe, be sure to check out the original pieces by the gallery’s featured artist for January and February, McDowell County resident Gina Gomez-DeGrechie. This entry was posted in Uncategorized and tagged art, Old Fort / Andrews Geyser, Winter by Inn on Mill Creek. Bookmark the permalink.